to our customers in Manchester, Leeds, Stoke On Trent, Nottingham, Sheffield, Birmingham, Luton and Watford and all around UK. We are working in window blinds industry for last many years and we have built a strong relationship among our customers. Whenever you make plan to decorate your windows with blinds, you can free request for a quote from us. Our Blinds Expert will personally take the measurement and after that we will install the item free of cost. Whether you have one window or whole your house to decorate, Impress Blinds will accommodate you according to your desire on very affordable and cheap rates with best quality. This is how we are working very smoothly in Manchester, Leeds, Stoke On Trent, Nottingham, Sheffield, Birmingham, Luton and Watford and all around UK. Call us for your free custom made to measure blinds and quote. Our perfect fit window blinds Team will get in touch with you quickly and surely you will get the solution of your query in a better way. Whether you have one window to furnish or a whole house, Impress Blinds can accommodate all of your needs. Impress Blinds will help you find the RIGHT type of blinds at the RIGHT prices. Do you wish to make your interiors look bright, vivid and attractive with perfectly accurate windows blinds covering your windows in any sizes and dimensions? Impress Blinds offers top quality Made to Measure Blinds that can be designed specifically for your windows fitting all size, design and dimension descriptions perfectly. Our custom size and style options are always available to design your precise windows blinds with many different materials, designs and styles. Why settle for any less than perfect? Impress Blinds provides a great windows blinds experience where we measure your windows perfectly and also fit your windows blinds free of cost. Never will you have to get over the counter sold windows blinds in wrong sizes or dimensions and have to fit them by yourself. Perfect Made to Measure Blinds that we offer will take care of all your needs and requirements. All our special quality Made to Measure Blinds in different materials, colors, designs and styles are cut specially for your windows. We will provide you inch perfect windows blinds that will not only cover the full dimensions of your windowpanes providing enhanced control over outside elements but will look neat and clean at the same time. 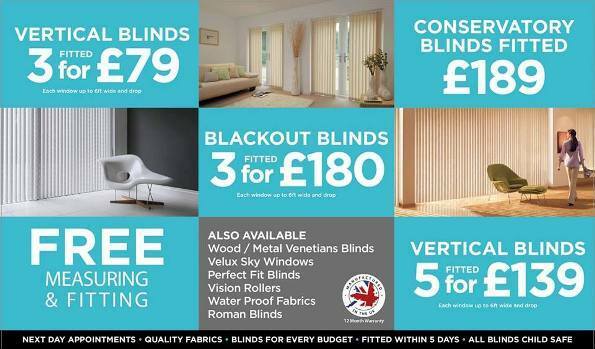 Are you fed up with supermarkets or even some home retail stores handing your over the counter sold windows blinds? Impress Blinds aims to impress you with our attention to detail and high quality service that will provide a great overall experience. In the UK, for areas that we service in, we offer free windows measurement service where we will send out an expert who will take all measurements for your windows precisely without even leaving out a centimeter of space unaccounted for. Whether you have regular shaped windows or some unique designs, our expert will take all factors into account when measuring it and have the most precise custom Made to Measure Blinds ready for your as soon as possible. Once your windows blinds are ready, we will come down to your location and install them totally free of cost as well. Our free installation service will ensure all parts of our delivered windows blinds are working properly with a functional opening and shutting or rolling mechanism and also the fact that every single screw, nail or holder is in its right place looking neat and clean.